To combat Islamophobia and celebrate ancient Middle Eastern culture, two Florence museums have teamed up to stage an exhibit on Islamic art and the reciprocal relationship between Florence and Islam. 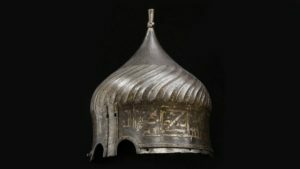 The exhibit, titled “Islamic Art and Florence from the Medici to the 20th Century,” runs through Sept. 23 at the Uffizi Gallery and the Bargello Museum, showcasing 250 objects collected over 500 years. Florence’s relationship with the Middle East began in 1400 and flourished as a trading partnership during the Medici family’s reign from the 15th to 18th centuries, and maintained that relationship through the early 20th century. The Republic of Florence exported textiles made of silk and velvet, and imported spices, carpets, raw silk, and vessels from what is now Spain, Egypt, Turkey, Syria, Iran, and Iraq. Florentine traders and collectors acquired or commissioned objects such as include Ottoman silks, Moorish ceramics, Egyptian carpets, and Persian illuminated manuscripts, all shown in the exhibit. Further, the relationship between two was enhanced – albeit indirectly – by Islamic scholars’ discovery of geometry, mathematic theories, and optics, which helped Renaissance painters use perspective in their work. The Uffizi portion of the exhibit contains antiquities and shows how Islamic art influenced Florentines in the Renaissance. Giant, intricately woven carpets, which were immensely popular in Florence in the 15th and 16th centuries, are on display, along with a painting by Gentile da Fabriano called “Adoration of the Magi,” in which Mary’s and Joseph’s halos contain Arabic inscriptions. Also in the collection is a Persian-language manuscript of the epic poem “Shahnameh” by the poet Ferdowsi from 1217. It is the world’s oldest manuscript of the poem, and was acquired by an Italian trader in the 16th century. Nearby, the Bargello Museum highlights items collected by Italian art lovers and dealers in the 19th century. As in much of today’s Western world, unfortunately, Islamophobia is prevalent in Italy. In a May survey of 15 western European countries, the Pew Research Center found that 53 percent of Italians viewed Islam as “fundamentally incompatible with their culture and values,” while 57 percent would not, or unsure if they would, accept a Muslim in their family. These numbers were some of the highest among survey participants. “Negative attitudes toward Islam are more pervasive in Italy than elsewhere in Europe,” said Neha Sahgal, associate director for research at the Pew Center. Academics believe this is largely due to lack of exposure and negative media portrayals of terrorism and unrest in the Middle East. As Florence does not have a mosque – the city’s Muslims worship in a former parking garage – many residents aren’t familiar with the religion or Middle Eastern culture. Alongside the exhibit, the Uffizi is offering programs to educate visitors about Islam and Middle Eastern culture in hopes that the exposure will provide an antidote to racism and fear. These programs include Arabic calligraphy workshops and guided tours in Italian and Arabic and, for children, workshops on the Muslim veil, science, and carpets.